ThinkTechSol concentrate on quality production that is the reason our team developed an enterprise application to provide graphical detection point for cyber attacks. 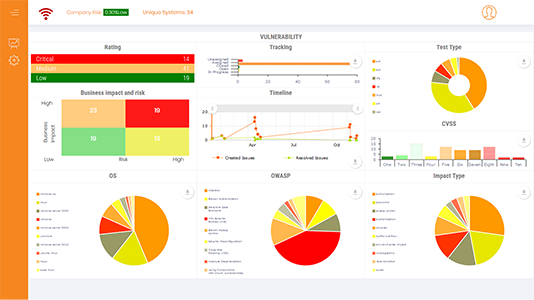 Our dashboard shows the statics of the identified vulnerabilities to the top management. 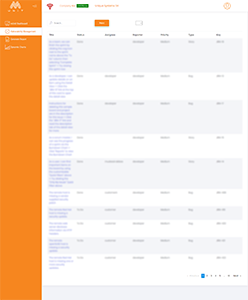 mUnit Management System along with statics automatically log identified bugs and cyber attacks by mUnit Pentester in JIRA. mUnit is basically is a Information security Solution for Big Business Enterprises e,g (Telecom companies, Hospitals, Govt Entities etc) to secure their organization networks from possible attacks. We all live in a world which is networked together, from internet banking to government infrastructure, and thus, network protection is no longer an optional extra. Cyber-attack is now an international concern, as high-profile breaches have given many concerns that hacks and other security attacks could endanger the global economy. A cyber-attack is a deliberate exploitation of computer systems, technology-dependant enterprises and networks. Cyber-attackers use malicious code and software to alter computer code, logic, or data, resulting in disruptive consequences that can compromise data and lead to cyber-crimes such as information and identity theft or system infiltration. In August 2015, the personal attack of 2.4 million Carphone Warehouse customers, including bank details and encrypted card digits, was affected by a data breach. Similarly, in December 2015, it emerged that in the previous June, the personal details of 656,723 customers of high street pub chain JD Wetherspoon were revealed, and the data was available for sale on the dark web. By far the biggest, and most recent data breach however, happened in October 2015 when almost 157,000 TalkTalk customers had their personal data hacked into. 15,656 customers had their bank account numbers and sort codes leaked, resulting in bank accounts being hacked. As a result, the telecoms company lost 101,000 customers and suffered a cost of £60 million. Given that cyber-crime is worryingly regular, it is no surprise that governments and businesses are seeking elevated cyber defence strategies. In 2014, the European Network and Information Security Agency held a cyber security exercise involving 29 countries and over 200 organisations. The test simulated more than 2,000 cyber incidents including website defacements, access to sensitive informational and attacks on critical infrastructure, with software and hardware failures judged the most damaging security threats.